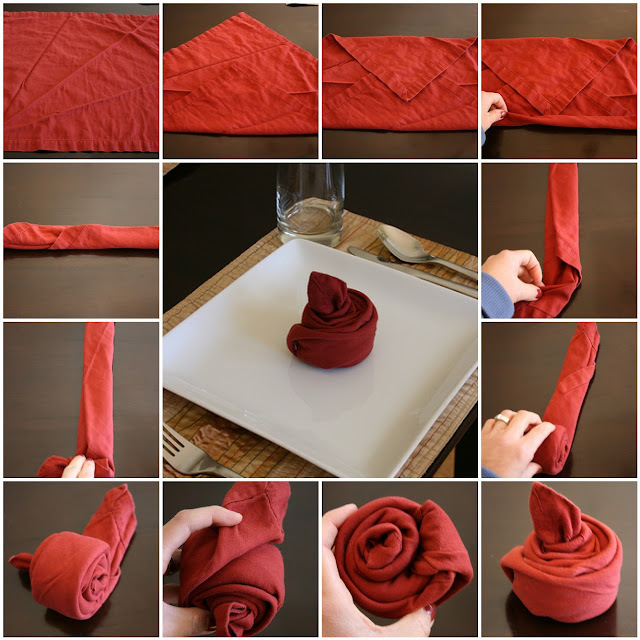 This napkin trick is my classic standby for entertaining. It looks time consuming, but isn't really. Often, attending to little details makes guests feel extra special...unless of course you do what I did last night and ask your guests to fold their own napkins because you're in a time crunch :) Next time I'll try to plan my time a little better! Start with the top left corner and "read" the photo like a book moving left to right. Follow each step and in about one minute, you'll have yourself your own pretty napkin bud. The great thing about this little trick is that you don't have to have a perfectly ironed napkin (see photo!). It just gets all wound up anyway! 4. Begin rolling into a one-inch fold. 6. Turn about two inches of the end to the side at a right angle. 8. Keep rolling, the bud is beginning to take shape. 10. Turn end to the side at a right angle leaving some length to tuck. 11. Tuck under into one of the creases. 12. Voila! A flower bud awaits. Thanks for the tutorial, Steph! I just rolled all my lovely orange napkins for tomorrow night's Halloween dinner party... They're going to look terrific! I did it! It looks great. Thanks for this!